The psalmist is objectifying some of God’s character. He seems to be saying that God’s faithfulness stands ready for anyone especially those who feel abandoned. It might have been through a death of a loved one, the break-up of a marriage or an engagement, or the splitting of old friends. The feeling of security and steadfast companionship is not only inherent in God, it surrounds him like a bubble. We are told we are made in the image of God, yet many of us do not show or know faithfulness. How can we access some of this faithfulness which surrounds God? 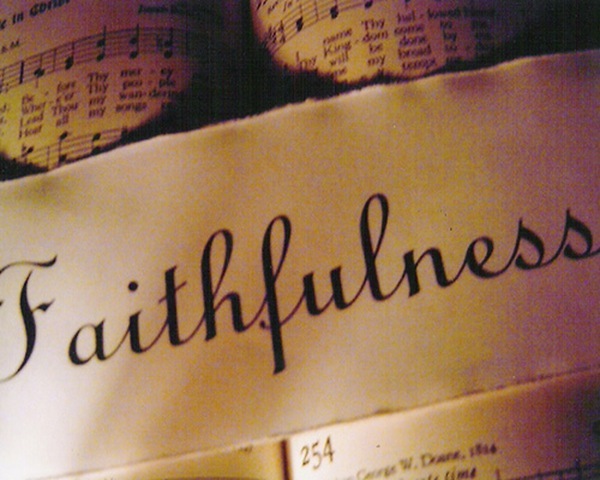 The psalmist became aware of that faithfulness through his life experiences. He saw patterns and experiences that helped him believe that God was good, that God was caring, that God was faithful. And in this psalm he wrote words to go along with music that praised God for who God is and what God is like. One way we can access this faithfulness is by looking for examples of faithfulness like the little church that decided to begin a bus outreach ministry. They undertook visiting, inviting and then busing minority and underprivileged children to their church for Sunday School. When they began they vowed to do it for at least 25 years. They kept that unusual vow with the help of dedicated workers and the sustaining hand of the Lord. When we see examples of faithfulness, we can spread them through imitation. It doesn’t have to be so big it is written up in the news, but it sure helps. Mother Theresa is one recent example of faithfulness to the poor which inspired many others plus a whole community of like-minded individuals. This entry was posted in Country, Courage, Creation, Faith, Faithfulness, Fear, Heaven, love, Perseverance, Perspective, relationships, Service, Trust, Uncategorized and tagged Church, Identity, Perseverance, Principles, Surrender, Trust. Bookmark the permalink.